A squirrel tried to kill me. 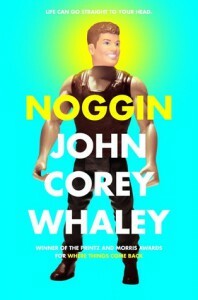 I was sitting in an Adirondack chair under a Maple Tree enjoying the evening breeze, reading the book 'Noggin' by John Corey Whaley. When I hear a loud whooshing sound of something falling through the leaves. I screamed and moved out of the way. There sitting beside me on the ground was a half-eaten apple. I looked up at the tree and saw a squirrel peeking through the leaves at me. "Damn squirrel!" I yelled and opened my book back up. Moments later, I see the squirrel sitting in the lilac bush plotting how to get his apple back. I did manage to finish reading Noggin despite being almost murdered by a squirrel. Noggin is so funny and incredibly sad at the same time that your laughter fights with your tears. This book is my favorite of the year! Five years later, it was reattached to some other guy’s body, and well, here he is. Despite all logic, he’s still 16 and everything and everyone around him has changed. That includes his bedroom, his parents, his best friend, and his girlfriend. Or maybe she’s not his girlfriend anymore? That’s a bit fuzzy too. "Found her," he interrupted. "She's at Carrie's OK Bar. It's downtown." "What the hell is Carrie's OK Bar?" "It's a karaoke bar. Travis, come on." "Wait, how do you know she's there?" "She checked in there about twenty minutes ago." "Oh. Right. Since you left, it's become very important that we all constantly know each other's thoughts, locations, and birthdays." "That's really stupid. Except for in this one very specific situation. I can't go if her fiancé's there, though. That would be too weird." "Because she put 'Girls' Night' with about five exclamation points after it." "Are people just asking to be murdered?" "I'm not sure I can do this anymore." "This. Exist. Be here like this with everything so fucked up." "Hey, Travis? I don't think it really matters if you know how to exist." "I don't think any of us do." "I don't know. We're just meandering."